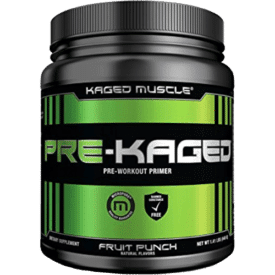 Start your search for a pre-workout supplement by seeing what Kaged Muscle Pre-Kaged is all about. Pre-Kaged contains 274mg caffeine, which is about three times when you’d get in a cup of coffee. Creatine, citrulline, betaine, and beta-alanine are other features. Be cautious, as the high caffeine content may be too high. The product also contains sucralose, a sugar that might interfere with some workouts. Legion Pulse has citrulline, beta-alanine, and ornithine to increase your body’s endurance. Ornithine assists in starting the lipid oxidation process to burn fat for energy instead of carbohydrates or glycogen. A service of Legion Pulse also contains 144mg of sodium. This compound will move water into your muscles, thus keeping them active. 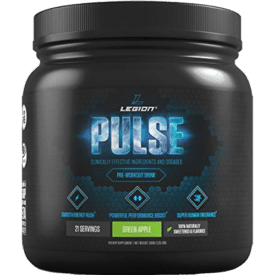 Legion Pulse also contains no artificial flavors or sweeteners. But be advised that Legion Pulse does have 350mg of caffeine per serving. 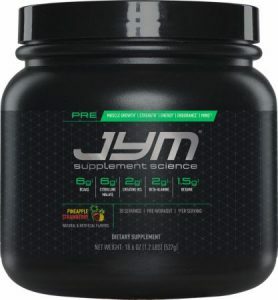 JYM Pre-Workout includes tyrosine and cysteine. Tyrosine increases your body’s focus, while cysteine keeps cells from being damaged during the workout. The black pepper extract in the supplement also improves upon how your body can absorb these and other ingredients. Each serving of JYM Pre-Workout contains about 80 calories. That total is much higher than what you’ll find elsewhere. The supplement also contains artificial sweeteners, although this does come in various flavors. 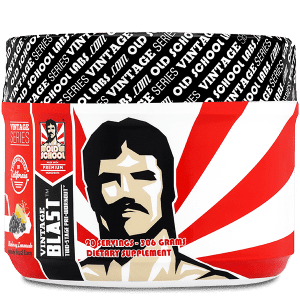 Vintage Blast contains citrulline plus 50mg of sodium. But what makes Vintage Blast even more attractive is that this includes 1g of arginine. The amino acid oxidizes HMB, a compound naturally produced within the body. HMB is needed to protect muscle tissues and to keep muscle proteins from breaking down. Vintage Blast improves upon your body’s ability to build lean muscle mass. Aspartic acid makes for a vital part of Vintage Blast. This compound increases the body’s natural testosterone production for added energy and muscle support. The Old School Labs product is best-suited for pump actions. Vintage Blast does well with preventing soreness during a workout. The exciting part of this Optimum Nutrition product is that it offers many powerful nutrients while having just 175mg of caffeine in each serving. The product features 1.5g of beta-alanine and 3g of creatine for providing you with extra energy and support for a workout. The combination of healthy nutrients in this Gold Standard product does not include any banned substances. Such illegal compounds include dangerous hormones and steroids. 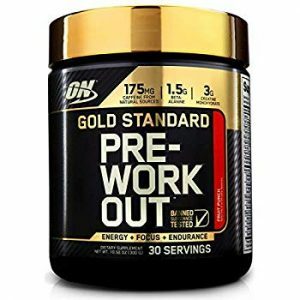 The clean nature of Gold Standard makes it a useful product for many workout needs, especially for those looking for help with their cutting routines. 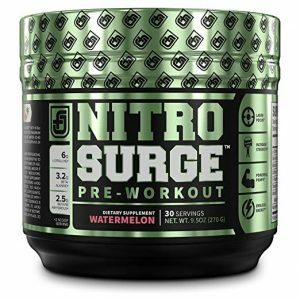 One part of Nitrosurge PreWorkout entails the use of betaine anhydrous, a compound that boosts muscle growth. Nitric oxide levels are supported to improve blood flow throughout the body. Bioperine is included in the Nitrosurge product to improve upon the body’s ability to absorb the ingredients. Produced by Jacked Factory, Bioperine is a black pepper fruit extract. The compound increases the body’s uptake of nutrients and amino acids. You can use one or two scoops of the supplement before your workout. A larger dose may provide better results. 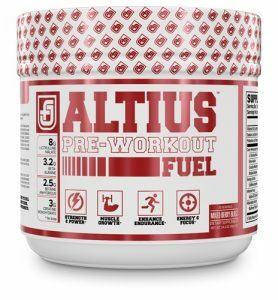 Another choice from Jacked Factory, Altius utilizes citrulline malate, betaine anhydrous, and beta-alanine. About 325mg of caffeine fits into the product. Jacked Factory promotes this product as working without any proprietary blends. The lack of artificial flavors or dyes makes Altius a useful product. The same amount of Bioperine is included here as it is in Nitrosurge. 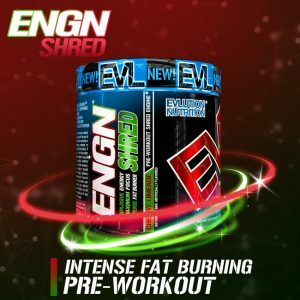 The ENGN supplement gives you power over your workout while concentrating on your focus. Pikatropin is included as an ingredient to promote blood flow in the brain. The added flow increases the body’s alertness and muscle coordination, not to mention the user’s focus. EVLution Nutrition promotes some unique ingredients developed exclusively for use in this product. Huperzine A is listed as a compound that increases the body’s focus, although the group has not specified what makes this product work. Infingery is a listed ingredient featuring caffeine and malic acid to support thermogenesis, although EVLution again does not list details on what else that ingredient includes. 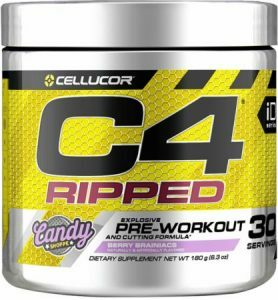 C4 is a muscle pump-focused choice that offers 150mg of caffeine. About 1g creatine nitrate is also included to enhance the body’s performance during a workout. Acetyl tyrosine is added to support the body’s energy stores. Vitamin C is also added as a healthy antioxidant that keeps the oxidative stress in the body from wearing out. The mix is easy to consume and does not cause discomfort. An interesting part of MusclePharm is that the supplement offers more support for the body throughout the entire workout. The supplement does not cause the body to experience excess stress, nor does it cause sluggishness as a workout moves along. 2g of beta-alanine are included to improve upon the body’s workout routine. 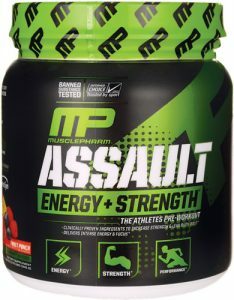 MusclePharm promotes this product as having PureEnergy, an ingredient that features various natural extracts to provide the user with a boost of energy that lasts longer than what caffeine generates. The product is listed as having caffeine anhydrous and pterostilbene, a defensive compound that resists oxidative stress. Coconut water powder is also included with the powder mix. Coconut water hydrates the body faster than regular water while also enhancing the body’s reaction to a workout. 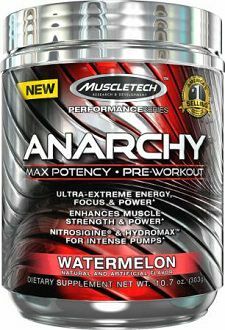 The pump-supporting action produced by MuscleTech Anarchy helps muscles to stay strong. The product has more caffeine than most other alternatives. Specifically, you would get 380mg of caffeine in each serving. About 3200mg of beta-alanine is also added to enhance the muscle-building process. The product utilizes Nitrosigine as a key energy-booster. Nitrosigine is a complex patented by MuscleTech for providing the body with energy. This works by boosting nitric oxide levels in the blood. As the nitric oxide increases, the body experiences a strong build and improved muscle contractions. 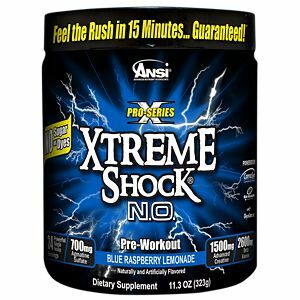 The use of beta-alanine is a critical part of ANSI Xtreme Shock NO that people can utilize quite well. The supplement uses a nitric oxide precursor for promoting proper blood flow. The added flow ensures the body will receive the energy it requires. The added 1500mg of creatine stimulates the muscles. About 200mg of caffeine is also included in each serving. See what this Performance Lab option has to offer for your needs. Sport is a stimulant-free choice that improves upon the body’s ability to handle more repetitions. The ATP is naturally increased, thus boosting the body’s energy stores and blood flow. The approximately 1000mg of creatine in each serving adds an outstanding solution for your pre-workout needs. The added creatine promotes muscle growth and stimulates proteins needed for lean muscle mass. 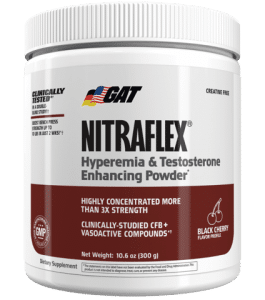 GAT Nitraflex offers 1600mg beta-alanine and 325mg caffeine, but the rest of this is in a proprietary blend where the user doesn’t know how much of each compound is included. But the supplement blend does contain all the critical amino acids one needs like citrulline and arginine. Calcium fructopyranose borate is also added to increase testosterone levels. Nitraflex is designed to release the body’s testosterone stores to enhance a workout. The excess caffeine may be tough for some to handle. Some of the best pre-workout options you can find are made with men in mind. Transparent Labs Bulk is one such choice. In addition to supporting added muscle bulk with citrulline and beta-alanine, the product also comes with added vitamin D and zinc. The two nutrients are required for increasing a man’s testosterone levels. About 5mg of boron is included for extra testosterone support. The added hormone promotes muscle mass. There are also some pre-workout supplements that are built for women to utilize. 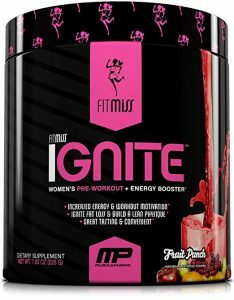 FitMiss Ignite is a useful choice. The supplement includes 100mg of caffeine, a low enough total that most women can safely handle. Details on the concentrations of compounds in Ignite’s proprietary blend are unknown, but beta-alanine, choline bitartrate, and tyrosine are the top-listed ingredients. The key part of Ignite is that it focuses on muscle endurance. Choline bitartrate is included to reduce fatigue in the body. Agmatine is also featured as an acid for increasing nitric oxide levels, thus enhancing blood flow. The support for endurance makes this ideal for women, although this might work for some lightweight men. Vegetable juices are used in the production of Ignite to produce a natural color and flavor. Sucralose and some other artificial sweeteners are among the ingredients though. 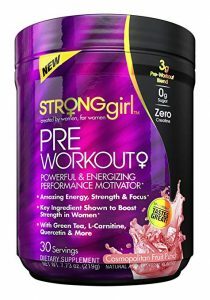 StrongGirl Pre-Workout is slightly stronger at 125mg, but it also includes 3g of carbohydrates for energy. About 80 percent of one’s daily recommended value of vitamin B6 and about 33 percent of vitamin B12 are also included. B6 reduces stresses through the production of norepinephrine. B12 improves upon the body’s energy stores. Taurine, beta alanine, green tea extract, and carnitine tartrate are also included in the proprietary blend, although once again their concentrations are unknown. Carnitive tartrate improves upon the body’s focus. Green tea extract supports thermogenesis, the body’s ability to burn off fat. The Japanese raisin tree extract is an intriguing part. The compound helps the liver process alcohols. But what makes the extract vital for your pre-workout needs is that the compound prevents nausea or headaches from developing during a workout. 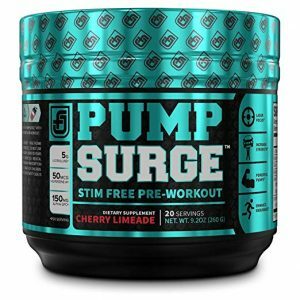 Jacked Factory has a pre-workout supplement for women called PumpSurge. The supplement focuses on muscle pumps while preserving lean muscle mass. Glycerol powder is added for extra energy. Citrulline and black pepper extract are also included; the latter improves upon the body’s ability to absorb the ingredients. There is only 100mg of Alpha GPC; about 500mg is recommended for results. Alpha GPC triggers the brain into releasing acetylcholine, a chemical needed for enhancing muscle memory. 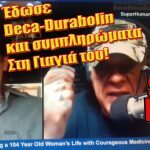 What About For Cardiovascular Workouts? You can also find some pre-workout supplements if you are planning on some cardio exercises to go with your strength training efforts. Earth Fed Muscle Stammpede is one of the best supplements to use in this case. Each serving of the supplement contains less than 10 calories and includes about 200mg of caffeine. Leucine and valine are included as amino acids needed for healthy muscle growth. Organic stevia is included for flavoring and to produce energy. Stevia is popular for being a sugar alternative that is easier on the body. This is part of the organic and natural composure of the supplement; you will not find any artificial flavors or ingredients here. The amount of citrulline malate is rather low though. The supplement contains only 1g of this in each serving. A person should be getting 5g for better results. Each of these choices for a pre-workout supplement is useful for offering helpful ways to get your body ready for your exercises. But you must look at what makes each of these products so ideal. Every supplement is different based on what its intention is for, how the product is laid out, and how much of each ingredient is included in a product. The supplement should be considered well beyond just the flavor or how you can consume the supplement. Review every product list of ingredients, not to mention how those items are made. Don’t forget to also look at what the unique ingredients or blends feature; this includes understanding how well those added features will work for your body. Knowing what to get for your workouts can make a difference in your routine. What Will Go Into Your Choice? Caffeine is included to enhance your endurance and ability to handle weights. You must watch for how much caffeine is included though; an excess amount could make the body feel jittery. Beta-alanine assists in the development of stronger muscles. The body’s muscle fibers will be less likely to develop fatigue. The ingredient can produce a tingling sensation in the body as it is consumed, although the user can get used to this feeling after a while. Taurine speeds up your body’s recovery during a workout, thus reducing your risk of being fatigued. This amino acid also prevents muscle cramps. Citrulline facilitates enhanced blood flow, thus increasing your energy. Creatine positively influences your ability to generate power during a workout. Tyrosine enhances your muscles’ focus. The compound may also reduce stress. Betaine increases the body’s power output. Nitric oxide facilitates the muscle’s pumps or general movements. The ingredients will vary by each product. Some combinations may also be included in the nutritional label. Check the container label to see what goes into your pre-workout product. Don’t forget to see how much of each ingredient is included. See how well the supplement keeps you hydrated. From water extracts to sodium, many supplements contain ingredients that keep you hydrated. Look at how many calories are in each serving. Most choices have about 10 to 40 calories per serving, but others might go too high. Many options are even calorie-free. Figure out if there are any artificial ingredients. Many of today’s workout products are all-natural options that contain no artificial items. Such natural products are easier for the body to tolerate. Watch for your caffeine consumption during the day, so you don’t consume more than necessary. 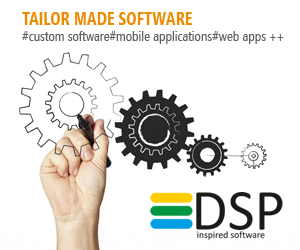 Some choices come with formulas that feature unique or trademarked names. Always look at what goes into those formulas. Sometimes these include various amino acids or organic compounds. A company should include a full list of the ingredients that go into those items. The flavor should help keep everything down while being easy to consume. Look for a product that features natural flavors. The way how you consume whatever you are using will vary by product. Some pre-workout supplements come in a powder form that you prepare with water; these powders come in many flavors. You may also find some capsule-based supplements. Review the instructions for how to consume or mix these, not to mention how long before the workout you need to take them. Malate or malic acid is often included to enhance structure. 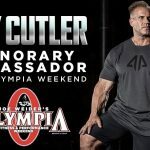 The ingredient may be found in citrulline. A ratio is listed next to a malate ingredient; the ratio refers to the amount of an amino acid versus the amount of malate included. Look at what the supplement you choose does for your body. Some of these products are made with women in mind, while others are for cardio needs. Each product uses different ingredients based on your workout goal and physical qualities. Avoid consuming a higher dosage than what your body can handle. It might take a bit for you to experience positive effects. In many cases, you might have to wait an hour to feel those effects. The timing will vary by each person.